Show employers you have career-ready skills with the Arizona Career Readiness Credential. Gain management skills with the Management Training Series. In addition to the 80 associate degree and certificate options offered at Mohave Community College, you also have the opportunity to learn highly-desired workplace and management skills. MCC and its local and state partners are here for you. 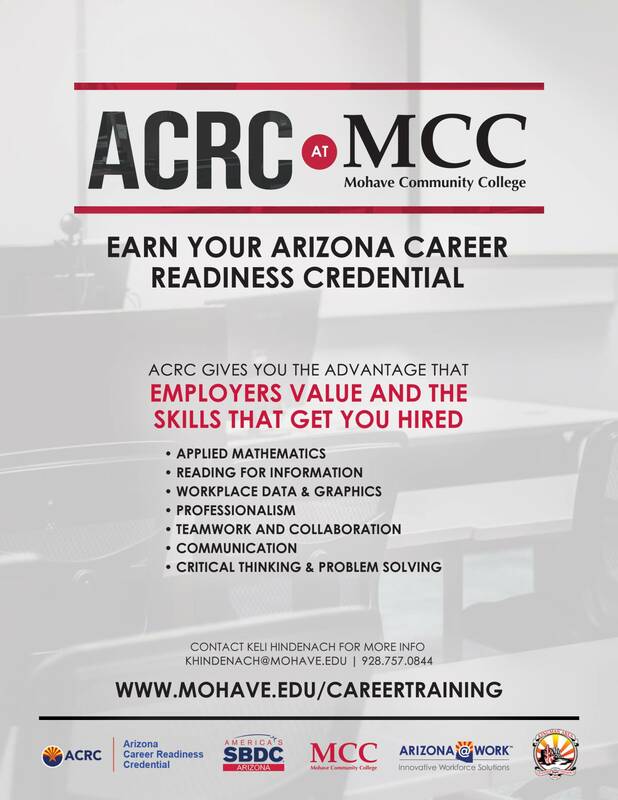 Mohave Community College has created a series of four-hour courses to teach you seven core skill areas that comprise Governor Doug Ducey’s Arizona Career Readiness Credential. These are skills that employers have said are lacking in the local and national workforce. You can find a list of ACRC classes at https://ce.mohave.edu. Once there, go to Step 2 and select Neal Campus-Kingman to view the courses available. The courses in this series provide the critical skills and knowledge you, or your employees, need to effectively manage others. In each of the 12 classes you will learn practical techniques that will be beneficial to your workplace the moment you leave. You can find a list of Management Training classes at https://ce.mohave.edu. Once there, go to Step 2 and select Neal Campus-Kingman to view the courses available.